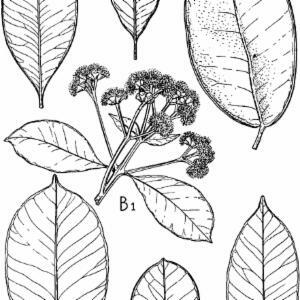 This genus is accepted, and its native range is Tropical & Subtropical Old World to Pacific. Fruit a fleshy or dry leathery berry with 1–2 (rarely more) ± large seeds; testa membranous to crustaceous; cotyledons fleshy, usually completely free or partially fused (rarely completely fused). 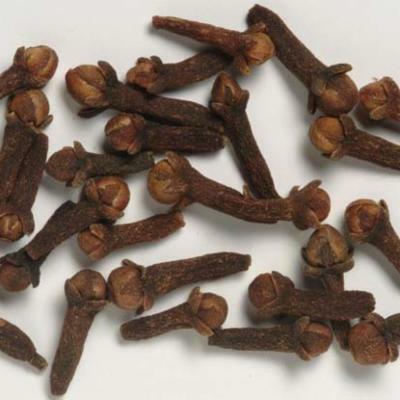 Trees, shrubs or rhizomatous, geoxylic suffrutices. Inflorescence usually a terminal, many-flowered, often compound and corymbose cyme, more rarely (S. cumini) a lateral cyme from the axils of fallen leaves. Bracteoles very small and inconspicuous, fugacious. Flowers bisexual, pyriform in bud. Receptacle gradually narrowed towards base to form a stout "pseudopedicel" above the articulation and expanded distally to form a rim-like "upper receptacle" beyond the apex of the ovary, which bears the stamens on its margin. Calyx forming an indistinct, irregularly lobed extension to the upper receptacle (African species) or distinctly lobed (S. jambos), eciliolate. Petals 4, suborbicular or obovate, caducous, cohering and falling together as a calyptra (African species) or falling separately (S. jambos), eciliolate. Stamens numerous, free, more than twice as long as the petals, very conspicuous, white or cream or bright red (not in F.Z. area). Ovary 2-locular; placentation axile; ovules numerous. Style slightly longer than the filaments, punctiform. Fruit a berry, usually 1-seeded. Belize, Bolivia, Brazil Northeast, Brazil Southeast, Cayman Is., Chagos Archipelago, Cook Is., Costa Rica, Cuba, Dominican Republic, Easter Is., El Salvador, Florida, Galápagos, Guatemala, Haiti, Honduras, Jamaica, Leeward Is., Madeira, Marquesas, Mexico Southeast, Mexico Southwest, Nicaragua, Panamá, Puerto Rico, Society Is., St.Helena, Trinidad-Tobago, Venezuela, Venezuelan Antilles, Windward Is. 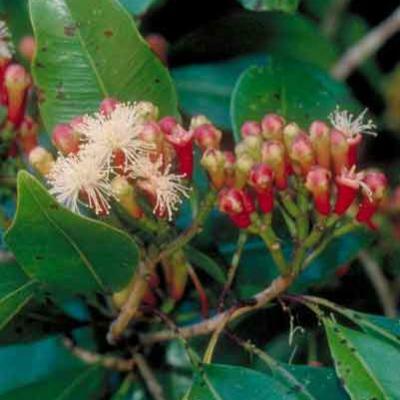 Syzygium aegiceroides (Korth. ex Miq.) Korth. Syzygium agastyamalayanum M.B.Viswan. & Manik. Syzygium aksornae Chantar. & J.Parn. 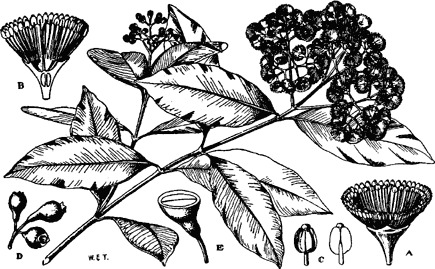 Syzygium anacardiifolium (Craib) Chantar. & J.Parn. Syzygium angkae (Craib) Chantar. & J.Parn. 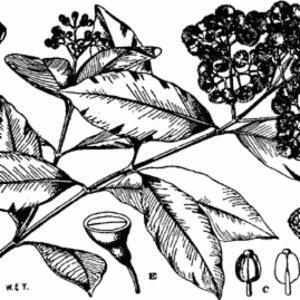 Syzygium angustovatum Widodo & Chikmaw. Syzygium balsameum (Wight) Wall. ex Walp. Syzygium benguellense (Welw. ex Hiern) Engl. 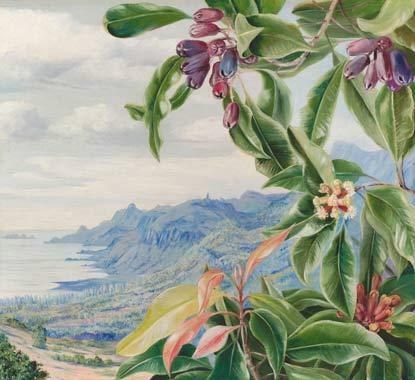 Syzygium bokorense W.K.Soh & J.Parn. Syzygium brazzavillense Aubrév. & Pellegr. 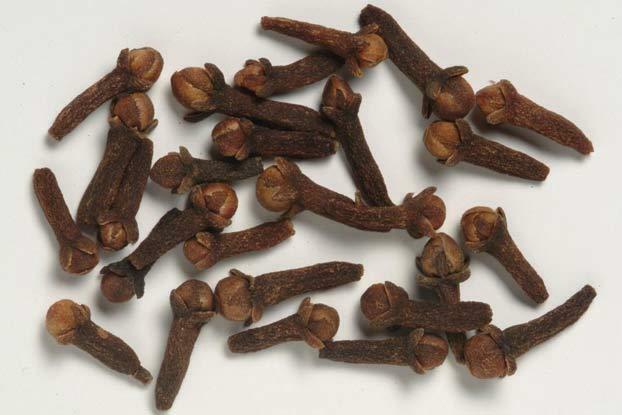 Syzygium cacuminis (Craib) Chantar. & J.Parn. Syzygium chantaranothaianum W.K.Soh & J.Parn. Syzygium craibii Chantar. & J.Parn. Syzygium cucphuongense W.K.Soh & J.Parn. Syzygium dawsonianum N.Snow, S.L.Young & Callm. Syzygium densiflorum Wall. ex Wight & Arn. Syzygium dyerianum (King) Chantar. & J.Parn. 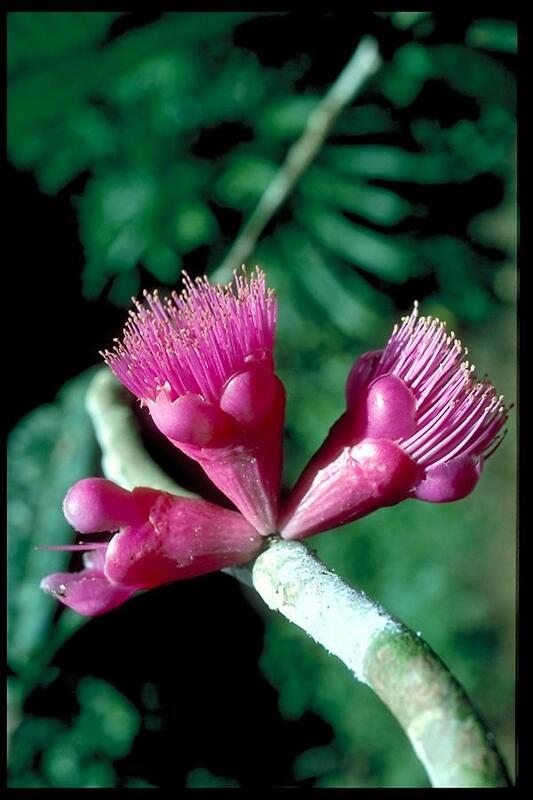 Syzygium filiforme Chantar. & J.Parn. Syzygium fuscescens (Craib) Chantar. & J.Parn. Syzygium glaucum (King) Chantar. & J.Parn. Syzygium globiflorum (Craib) Chantar. & J.Parn. Syzygium helferi (Duthie) Chantar. & J.Parn. Syzygium hemsleyanum (King) Chantar. & J.Parn. Syzygium hullettianum (King) Chantar. & J.Parn. 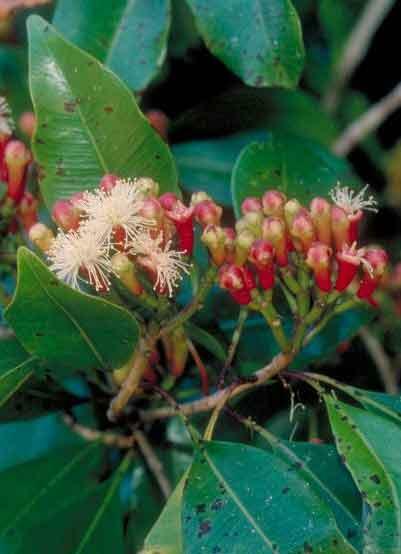 Syzygium ixoroides Chantar. & J.Parn. Syzygium jasminifolium (Ridl.) Chantar. & J.Parn. Syzygium kerrii Chantar. & J.Parn. Syzygium lakshmananii Murugan & Arum. Syzygium lakshnakarae Chantar. & J.Parn. Syzygium lanceolatum (Lam.) Wight & Arn. Syzygium maingayi Chantar. & J.Parn. Syzygium nervosum A.Cunn. ex DC. Syzygium nitrasirirakii Chantar. & J.Parn. Syzygium pergamentaceum (King) Chantar. & J.Parn. Syzygium periyarensis Augustine & Sasidh. Syzygium praineanum (King) Chantar. & J.Parn. Syzygium putii Chantar. & J.Parn. Syzygium quadrialatum Teijsm. & Binn. Syzygium refertum (Craib) Chantar. & J.Parn. Syzygium ridleyi (King) Chantar. & J.Parn. Syzygium rigens (Craib) Chantar. & J.Parn. Syzygium rubicundum Wight & Arn. Syzygium sahyadricum Sujanapal, Robi & Sasidh. Syzygium schwenckii Teijsm. & Binn. Syzygium scortechinii (King) Chantar. & J.Parn. Syzygium siamense (Craib) Chantar. & J.Parn. Syzygium sriganesanii K.Ravik. & V.Lakshm. Syzygium subhorizontale (King) Chantar. & J.Parn. Syzygium tayabense (Quisumb. & Merr.) Merr. 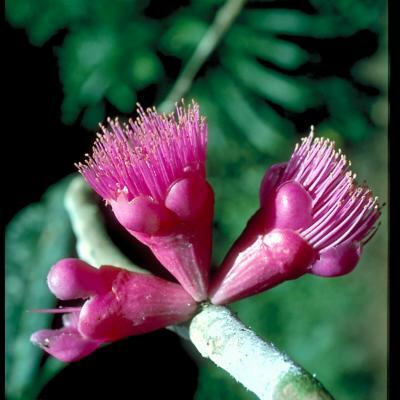 Syzygium tenellum Blume ex Miq. Syzygium tetragonum (Wight) Wall. ex Walp. Syzygium tetrapterum (Miq.) Chantar. & J.Parn. Syzygium triplinervium Teijsm. & Binn. Syzygium variolosum (King) Chantar. & J.Parn. 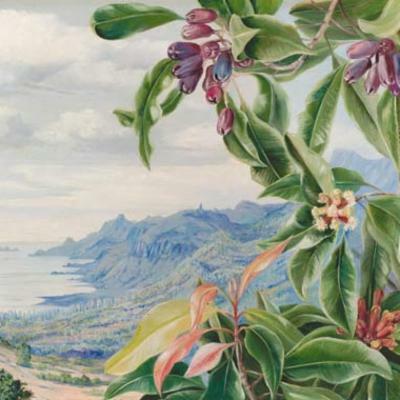 Syzygium vulcanicum Elmer ex Merr. Soh, W.K. & Parnell, J. (2015). 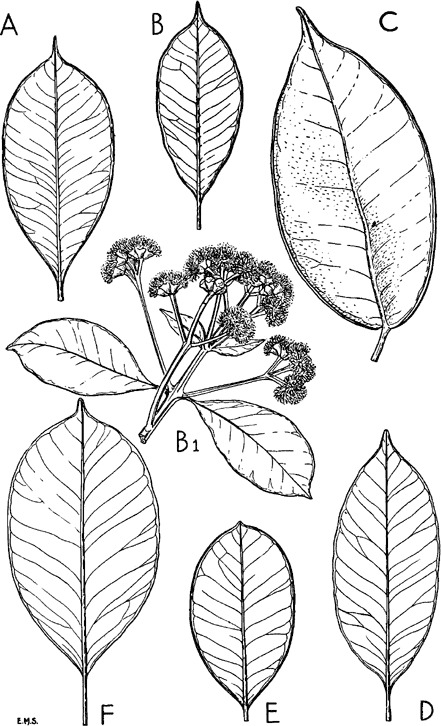 A revision of Syzygium Gaertn. (Myrtaceae) in Indochina (Cambodia, Laos and Vietnam) Adansonia, sér. 3, 37: 179-275. Fruct. 1: 166, t. 33 (1788). Fruct. & Sem. 1: 166, t. 33 (1788), nom. conserv.